Keen to see the parts of Paris that other tourists can’t reach? Daily Paris and its inhabitants is what you are looking for? You can do so with the help of the Greeters, because now, and after New York, Toronto, Buenos Aires and other great cities, the Greeters are here in Metropolitan Paris! The Greeters are local residents who love their city and are ready to give some of their time to enable visitors like you to see their city through their eyes. They are volunteers and offer their services free of charge. With the help of the Greeters you can find out about the everyday life of those who live in metropolitan Paris. 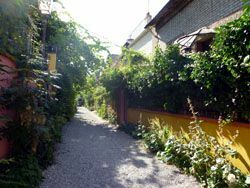 On leisurely walks, the Greeters will pass on anecdotes about their neighborhood, show you the places that tourists rarely get to discover and tell you the best places to go. This kind of tourism, free of charge and based on conviviality that feels like informal encounters, is a new way of seeing the life of the city. 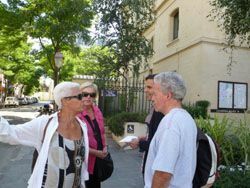 If walks in Paris with locals interest you check our other walking tours with authentic parisians! The network of Paris Greeters is running by Parisien d’un Jour, an association of volunteers. To request a walk conducted by a Greeter from Paris or its suburbs, you must use the association’s form by clicking on the link below. You need to put in a request at least two weeks prior to the date you require. That is the time we need to find you an available Greeter. The maximum number of participants is 6, so as to enable a true interaction between the Greeter and his or her companions on the walk. We communicate solely by email, until we find an available Greeter. It is therefore essential for you to be able to read and reply to your emails, including during your stay in Paris. Walks are free of charge and are in no way meant to be a tour with a professional guide. Each Greeter conducts his or her walk in the light of his or her personal approach to the city, his or her own experience. Greeters do not set themselves up in competition with professional guides. If you wish, it is possible for you to become a greeter! More information here.